The field of urban planning is far-reaching in breadth and depth. This is due to the complex nature of cities, regions, and development processes. 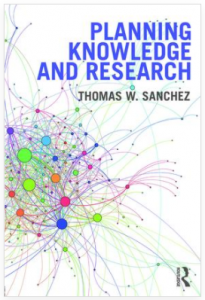 The knowledge domain of planning includes social, economic, technological, environmental, and political systems that continue to evolve and expand rapidly. Understanding these systems is an inter-disciplinary endeavor at the scale of several academic fields. The wide range of topics considered by planning educators and practitioners are often based on varying definitions of “planning” and modes of planning practice. This unique book discusses various elements and contributions to urban planning research to show that seemingly disparate topics do in fact intersect and together, contribute to ways of understanding urban planning. The objective is not to discuss how to “do” research, but rather, to explore the context of urban planning scholarship with implications for the planning academy and planning practice. This edited volume includes chapters contributed by a diverse range of planning scholars who consider the corpus of planning scholarship both historically and critically in their area of expertise. It is essential reading for students of planning research and planning theory from around the world. The following is the most recent update (as of 1/2017) and ranking of urban planning citation activity using Google Scholar Citations. These data are for urban planning programs and faculty in the U.S. and Canada, which currently includes 116 schools and 1,100 faculty. Faculty rosters were assembled from program websites, and attempted to include only “regular” (tenure track faculty) individuals at the rank of Assistant Professor, Associate Professor, and (Full) Professor. The objective is to represent faculty who are full-time members of these programs – not an easy task given the wide range of faculty appointments and affiliations. For instance , Luc Anselin from the University of Arizona is now listed on their website as a “Research Professor” (previously “Professor”) which means he is no longer the most cited urban planning faculty member. 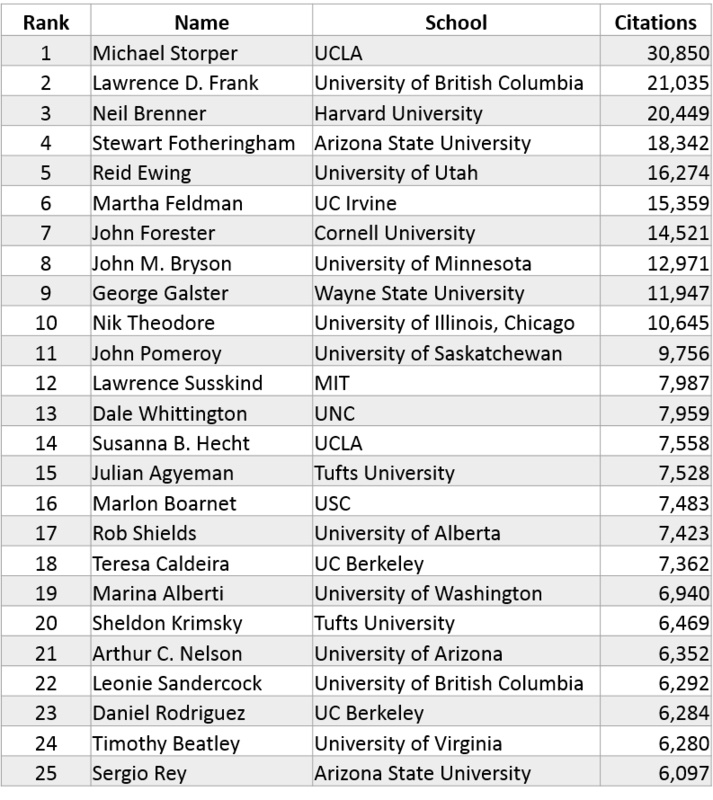 The top position is now held by Michael Storper of UCLA (see Table 1 below). Previous year results are available for 2016, 2015, 2014, and 2013. 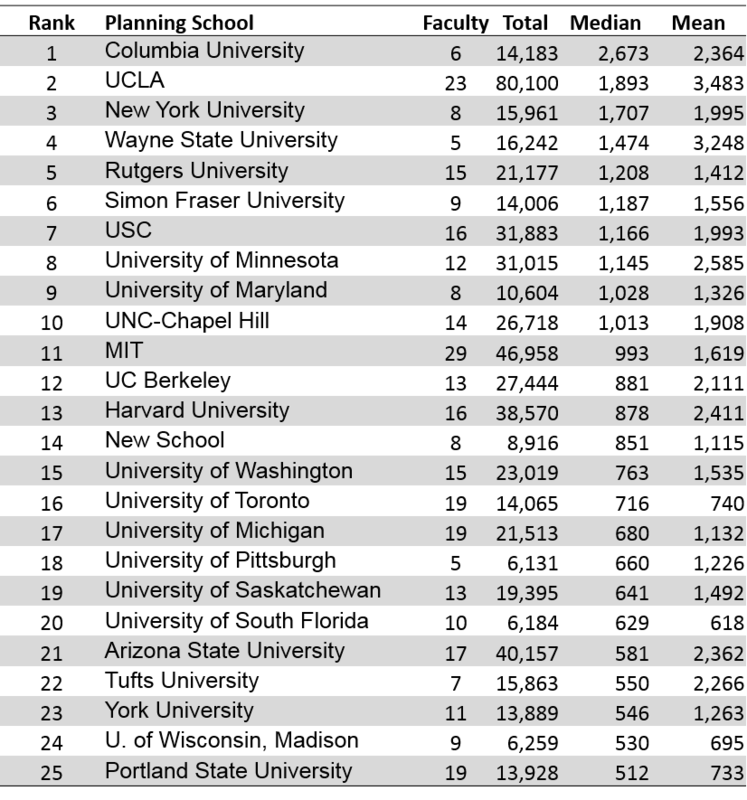 Columbia University remains the top ranked faculty based on median number of citations (see Table 2). More detail on the methodology is available in my recent article in the Journal of Planning Education and Research (JPER). In addition, the full, searchable database is available here. More analysis is forthcoming, stay tuned. Your comments are greatly appreciated. Please report any errors or omissions to: tom.sanchez@vt.edu. Inspired by Isidro Aguillo‘s ranking of scientists in Chile (see: http://www.webometrics.info/en/node/92), I prepared a ranking (by Hirsch Index) of urban planning faculty from schools in the U.S. and Canada. The list is based on the schools from my 2015 citation analysis and ranking (see: Planning Citation Analysis Update). Keep in mind this includes only planning faculty with Google Scholar Citation (GSC) profiles, where my 2015, 2014, and 2013 analyses included all planning faculty. Of the 1,000+ faculty, just over 400 had GSC profiles (as of November 30, 2016). See Aguillo’s description of the Google Scholar Citation methodology at: http://www.webometrics.info/en/node/179. My updated ranking for 2016 will be available during January 2017 on my website along with the searchable database at: http://scholarmetrics.com/. Your comments and suggestions are greatly appreciated.